Bryan offered commercial and laboring interests bimetallism (the use of silver, in addition to gold, in coinage) as a solution to what appeared to be a shortage of money in a country oppressed by debt and deflation. He was the last effective hope of the old People’s Party, which organized resistance to railroads and banks in rural areas where indebted farmers were losing their land in the face of falling agricultural prices. When Bryan lost the presidential election to William McKinley, the hopes vested in a simple monetary solution to the complex problem of economic depression were also defeated. Nevertheless, the growing contrast between the new capitalism of massive corporations—characterized by dominant monopolies and cartels and backed by growing financial markets—and the moralistic, entrepreneurial ideal of classical capitalism that inspired American free enterprise, ensured that “populist” economic critiques did not disappear. Indeed, some of the most innovative economic thinking of the ensuing decades grew out of this tradition. One of its most insightful figures was Michał Kalecki, who remains largely forgotten today. Kalecki’s work on cartelization, financialization, and the causes of economic stagnation illuminates many of the same problems we encounter in the present moment, and merits fresh consideration. A more lasting intellectual legacy of the populists is found in the work of Thorstein Veblen—most notoriously his sly, sardonic Theory of the Leisure Class (1899). Its style applies to social criticism the satire more commonly found in the novels of William Thackeray or Anthony Trollope. It engages the reader by imitating the faux naive simplicity of everyman in puncturing the pretensions of the sophisticated, leisured, conspicuously consuming urban elite.2 But Veblen expressed the economic attitudes of populism most starkly in his book The Theory of Business Enterprise (1904), a blistering critique of big business. This was one of the first books to analyze the economics of a capitalism dominated not by the calculating entrepreneur of romantic myth and economics textbooks, but by the large corporations whose affairs and scandals were uncovered by the Industrial Commission in the early years of the twentieth century. The commission had been appointed by McKinley in 1898 in response to the populist mood in the country at large. It revealed that the leading industrialists of the day, men like Andrew Carnegie, Cornelius Vanderbilt, and John D. Rockefeller, who claimed to have become rich by relentless industrial innovation and business efficiency, actually had done so through manipulating the capital markets. In his book, Veblen described business as ultimately condemned to stagnation because competition for work kept wages, and therefore mass consumption, low. The stagnation was only broken by occasional speculative booms in the stock market, periods when “captains of finance” deluded themselves that bubbly financial markets were real, only to be confounded eventually by the reality of limited mass consumption. Wars, such as the Spanish-American War of 1898, which created a run on armaments and military equipment financed by government debt, were another source of debt-fueled speculation.3 In what might have seemed like a confirmation of Veblen’s thesis, the Knickerbocker Trust Company of New York collapsed in October 1907, shortly after the book’s publication. The crisis that followed resulted in the establishment of the Federal Reserve System in 1913, which was supposed to put an end to financial crises—but obviously didn’t. Despite its apparent prescience, Veblen’s book never achieved the eminence of his earlier work on the leisure class. But its exposition of corporate finance was hugely influential among early writers on money and finance. Irving Fisher drew the most important ideas in his Debt-Deflation Theory of Great Depressions from Veblen.4 John Maynard Keynes featured the book in reading lists for his lectures at Cambridge. In Europe the new capitalism of corporations was studied by Rudolf Hilferding, who presented a much more systematic account of the economic and social impact of the new industrial behemoths. He called their harnessing of long-term financial markets for the purpose of corporate enrichment “finance capital,” which became the title of his most important book. Hilferding was a Marxist who first came to prominence among Austrian Social Democrats in 1904, with a vigorous defense of the labor theory of value against the criticism of Eugen von Böhm-Bawerk. In 1910, he published his book Das Finanzkapital: Eine Studie über die jüngste Entwicklung des Kapitalismus to wide acclaim among German and Austrian Marxists. The significance of the book, however, goes far beyond Marxist doctrinal disputes or the lending practices of Berlin clearing banks, for which it is best known. Of more lasting importance, Hilferding put forward two fundamental ideas about the operations of corporations and finance that place him among the founders of the modern theory of the business cycle and twentieth-century macroeconomics. The first idea was the notion that rates of profit for different firms vary according to their monopoly power and membership in cartels—collusion to fix prices being the standard way in which firms deal with “excessive” competition in difficult business conditions. Noncorporate businesses—the small and medium-sized enterprises that embody, much more than bureaucratic corporations, the entrepreneurial spirit of capitalism—are disadvantaged by such monopolistic practices. In any given market, the bulk of profits are swept up by large corporations, leaving smaller firms with marginal leftovers, or even losses. In the course of a business cycle, corporations therefore benefit disproportionately during the boom, while smaller firms suffer the greatest business casualties during the recession. This last possibility aroused the greatest controversy among European followers of Marx. If capitalism could indeed be stabilized through the coordination of business activity, then the prospect for the economic breakdown of capitalism, which was supposed to make socialism inevitable, would disappear. Hilferding himself rejected any such inevitability as condemning socialists to merely waiting for the next stage of history to emerge. Yet when the catastrophe of the First World War was followed by extreme shifts in European economic activity, economists in “Austro-Marxist” circles started to question the possibility of capitalist stabilization. On the fringes of these discussions, in newly independent Poland, was a young Polish business journalist, Michał Kalecki. He understood business because his father was a small factory-owner in the Polish manufacturing capital of Łódź, whose business had been ruined in the course of the 1905 Revolution (the rehearsal for the Russian Revolution of 1917). The young Kalecki, born in 1899, was forced to give up his engineering studies after his military service in the Russo-Polish War of 1920, and had turned to business journalism to earn a precarious living. Perhaps no one understood credit cycles and corporate capitalism better than this Polish journalist. He scoured the business and financial press for information not only about markets, but also about the corporations, banks, and smaller enterprises that made the economy work. Because of the similarities in their economic theories, Kalecki is commonly associated with the older, more upper-class British economist John Maynard Keynes. But there were important differences. Keynes, who was notoriously prone to believing that a boneheaded unwillingness to listen to his advice was all that stood in the way of human happiness, regarded business as benign, though overly cautious. Kalecki, by contrast, echoed the old populist suspicion of big business, but in a much more systematic way. The contrast between the two is very apparent in their respective views on one of the more colorful business heroes of the interwar period, Ivar Kreuger. In a world where all governments had difficulties making payments on the debts that they had incurred in prosecuting the First World War—debts that the Treaty of Versailles had secured on German reparations, which the German government could not pay—Kreuger specialized in buying up and canceling the bonds of indebted governments, in exchange for monopolies on the sale of matches. These purchases were financed by share issues of his companies in the New York market. With the collapse of that market in 1929, Kreuger had increasing difficulty providing the security that his bank creditors demanded. On hearing that the Economist magazine was about to reveal that he did not possess the necessary collateral, on March 12, 1932, he shot himself through the heart in his Paris apartment. Liquidate labor; liquidate stocks; liquidate farmers; liquidate real estate . . . it will purge the rottenness out of the system. High costs of living and high living will come down. People will work harder, live a more moral life. Values will be adjusted and enterprising people will pick up the wrecks from less competent people. Hoover’s memoirs, published in 1952, are usually cited as the source for this succinct statement of the bracing, morally therapeutic case for economic misery. In fact the term “liquidationism” was already in use by then to describe a government policy of providing minimal amelioration while awaiting the equilibrium that the price mechanism was supposed to achieve naturally in markets. Its chief proponents were Austrian economists like Friedrich von Hayek and Joseph Schumpeter, and American economic liberals like Henry Simons in Chicago. If only governments would stop trying to stem the fall in prices and wages, the “malinvestment” caused by government interference in those markets would eventually be eliminated, and economies would get back to their “natural” condition of full employment. In Europe, the country most badly hit by the Great Depression was Poland: it suffered the largest percentage increase in unemployment and the greatest percentage decline in industrial output. In 1933, Kalecki published in Polish his explanation of why economies went through successive phases of growth and recession, and why an economy may end up trapped in a depression, regardless of how much “freedom” is given to market forces. This is because, in any given period, actual employment and total production depend not on the ability of prices to converge to levels (intrinsic to our tastes, preferences, and resources) that will make supply equal to demand in all markets, but on the total volume of investment in infrastructure and industrial equipment that is undertaken in that period. That investment is essential because it then determines how much profit firms can realize. Indeed, without capitalists’ spending on their own consumption, and on investment, capitalists cannot turn a profit: just selling goods and services to their workers can at best enable employers to recoup the money that they have paid their workers as wages, and thus cover their wage bill. To realize profits, businesses need to invest and capitalists need to consume. In this sense then, corporations, monopolies, and cartels are parasitic upon a non-cartelized sector of small and medium-sized retail and industrial enterprises, farms, and so on. The profits from their individually modest investments accrue disproportionately, through the functioning of the markets, to the corporations that dominate those markets. The losses of the smaller businesses have to be covered from their reserves or by borrowing. In this way their inconsiderable savings pass into the possession of those corporations, whose accumulations of liquid assets (bank deposits) are backed ultimately in bank balance sheets by the mounting debts of the smaller businesses. In 1936, Kalecki came to Britain on a fellowship from the Rockefeller Foundation. With the emergence of authoritarian governments in continental Europe, including Poland after the military coup of Józef Piłsudski in May 1926, and the increasing belligerence of Nazi Germany, the foundation provided a lifeline to many intellectuals whose political circumstances were making their lives difficult. In Britain, Kalecki was introduced into Keynes’s circle by Joan Robinson. Keynes was impressed, sometimes even frustrated, by the younger man’s analytical abilities. But they both agreed that the dire weakness of business investment, which was the cause of the economic depression, would be overcome by a “synthetic” boom based on fiscal stimulus. This was what inclined them both to support the fiscal policy of Roosevelt’s New Deal. For Kalecki, a fiscal deficit has the merit not only of expanding demand in general. It also provides a market for the private sector that does not have to be paid for by the private sector, in the way in which businesses have to pay their workers if they are to sell their goods to their workers, or pay for investments so that firms in general can accrue profits. In this way, a fiscal deficit increases the revenues and profits of the private sector. Kalecki had very clear views on how such an economic stimulus should be financed. Ideally, it should be done by borrowing, thereby mobilizing the unused financial reserves of the corporations whose inactivity was the cause of the economic depression. But if there was political pressure to balance the books of the government, this stimulus could most effectively be financed by means of a wealth tax, taking money away from the rich in general, and returning it to business as profits, through the expenditure of those who are employed by the government or receive government welfare payments. As he argued, such taxation “has all the merits of financing the state expenditure by borrowing, but is distinguished from borrowing by the advantage of the state not becoming indebted.”18 Kalecki was not alone in advocating such a “capital levy.” Keynes was a keen supporter of this fiscal measure, along with Joseph Schumpeter and John A. Hobson, with endorsements going back two centuries to David Ricardo. In 1945, Kalecki left Britain to work in the International Labor Office in Montreal. In the following year he moved to New York to write economic reports for the United Nations Secretariat. With the advent of the Cold War, however, the climate of international relations and economic debate deteriorated, and it also poisoned his work in reporting on developments in the Communist bloc. In 1955 he resigned from the UN and returned to Poland, where he advised the government on economic planning. In the following year, 1968, Kalecki and his circle fell victim to factional infighting within the Polish ruling party, to which he had never belonged. The infighting gave rise to a purge of Jewish survivors, by then concentrated in the professions and the upper reaches of the Polish establishment, since most Jews who remained in Poland after the war had left for Israel after 1948. Kalecki was already in poor health. He resigned his government positions in solidarity with his fellow citizens of Jewish descent. In 1969, he made one last visit to Cambridge, England, where three decades earlier he had worked with Keynes. He died in the following year. American populism dates back to the economic depression that followed Reconstruction, and the failure of the economy to secure the economic and social positions of farmers and urban workers. The new corporations promised to revive industrial prosperity, but enriched mostly their owners and bureaucrats. The work of the Polish economist Michał Kalecki is the link between the early populists’ critique of the first massive corporate forms and the Keynesian revolution, and his insights can help inform the new economic thinking required to understand the industrial under-performance of America today. Kalecki showed how the large industrial-financial corporations are neither efficient, nor innovative, nor conducive to growth and entrepreneurship. If industries are in decline, then what is needed is an examination of where demand for their products comes from. In the case of America’s rust belt, the demand for its products comes from construction and investment in industry and infrastructure. It is that investment that needs to be addressed in order to revive declining industries. The tax system needs to target the “over-saving” or “financialization” of American corporations: their accumulation, on an unprecedented scale, of liquid assets that are turned over in the financial markets rather than in real business activity. Whether spent by the government on public services, or through enhanced industrial investment by those corporations, the money mobilized in this way will return as profits to business, creating employment along the way, rather than sterile arbitrage in the financial markets. 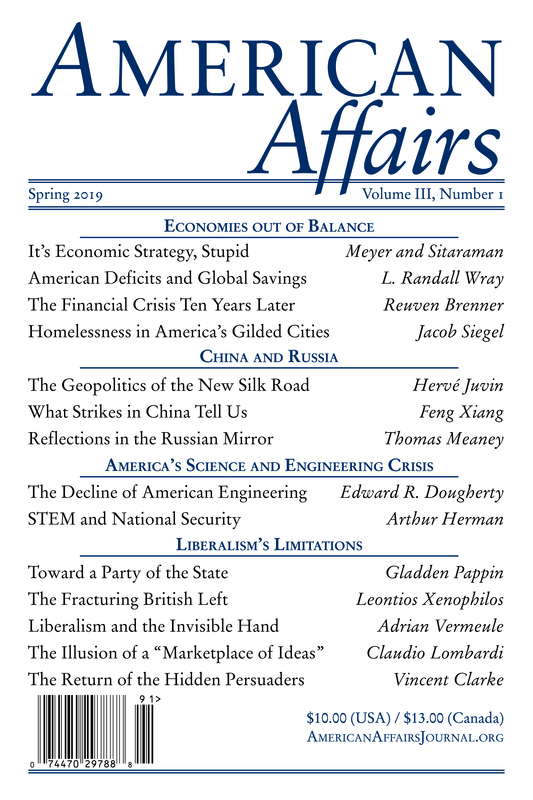 This article originally appeared in American Affairs Volume II, Number 2 (Summer 2018): 35–50. 1 Official Proceedings of the Democratic National Convention Held in Chicago, Ill., July 7th, 8th, 9th, 10th and 11th, 1896, ed. Edward B. Dickinson (Logansport, Ind. : Wilson, Humphreys, 1896), 226–34. Reprinted in The Annals of America, vol. 12, 1895–1904: Populism, Imperialism, and Reform (Chicago: Encyclopaedia Britannica, 1968), 100–5. 2 Thorstein Veblen, The Theory of the Leisure Class: An Economic Study in the Evolution of Institutions (New York: Macmillan, 1899). 3 Thorstein Veblen, The Theory of Business Enterprise (New York: Scribner, 1904). 4 Irving Fisher, “The Debt-Deflation Theory of Great Depressions,” Econometrica 1, no. 4 (October 1933): 337–57. 5 J. A. Hobson, Imperialism: A Study (London: Nisbet, 1902); Karl Polanyi, The Great Transformation (New York: Rinehart, 1944). 6 Rudolf Hilferding, Finance Capital: A Study of the Latest Phase of Capitalist Development, ed. Tom Bottomore (London: Routledge & Kegan Paul, 1981). 7 Tadeusz Kowalik, O Ludwiku Krzywickim: Studium Społeczno-Ekonomiczne (Warsaw: Państwowe Wydawnictwo Naukowe, 1959), 233. 9 Sten Kreuger, “The Match King,” Economist, December 19, 2007, 113–15. 1920–1937 (London: Macmillan, 1992), 435. 11 John Maynard Keynes, The Collected Writings of John Maynard Keynes, vol. 21, Activities 1931–9: World Crises and Policies in Britain and America (London: Macmillan, 1982), 90. 13 Kalecki, “Stimulating the World Business Upswing,” in Collected Works of Michał Kalecki, vol. 1, Capitalism: Business Cycles and Full Employment, ed. Jerzy Osiatyński, trans. Chester Adam Kisel (Oxford: Clarendon, 1990), 156–64. 15 Kalecki, “A Theory of the Business Cycle,” Review of Economic Studies 4, no. 2 (February 1937): 77–97. 17 Kalecki, “The Influence of Cartelization on the Business Cycle,” in Collected Works, 1:56–59. 18 Kalecki, “A Theory of Commodity, Income and Capital Taxation,” in Collected Works, 1:319–25. 19 Kalecki, “Political Aspects of Full Employment,” in Collected Works, 1:347–56. 20 Jan Toporowski, “Kalecki on Technology and Military Keynesianism,” SPRU Working Paper Series 2017-22, 1–8. 21 Kalecki, “Vietnam and U.S. Big Business,” in The Last Phase in the Transformation of Capitalism (New York: Monthly Review Press, 1972), 107–14. Jan Toporowski is professor of economics and finance at SOAS University of London. He has worked in fund management, international banking, central banking, and financial and economic consultancy.